The first three (ball, disc, and cartridge) are all types of "washerless faucets" since they do not use rubber or neoprene washers. The latter (compression) is very much your basic washer faucet. Let's take a look at each type and gain an overview of how they work and how they're different. We'll also provide you links to a repair tutorial for each type. Ball faucets are very common in kitchen sinks and were the first type of washerless faucet. They are identifiable by their single handle which moves over a rounded ball-shaped cap right above the base of the faucet spout. The ball faucet has a single handle which controls a special plastic or metal ball inside the faucet body. This ball has chambers or slots in it, along with rubber O-rings and spring loaded rubber seals. Depending on the ball's position, the ball/lever assembly controls the flow and mixing temperature of the water coming out of the faucet. 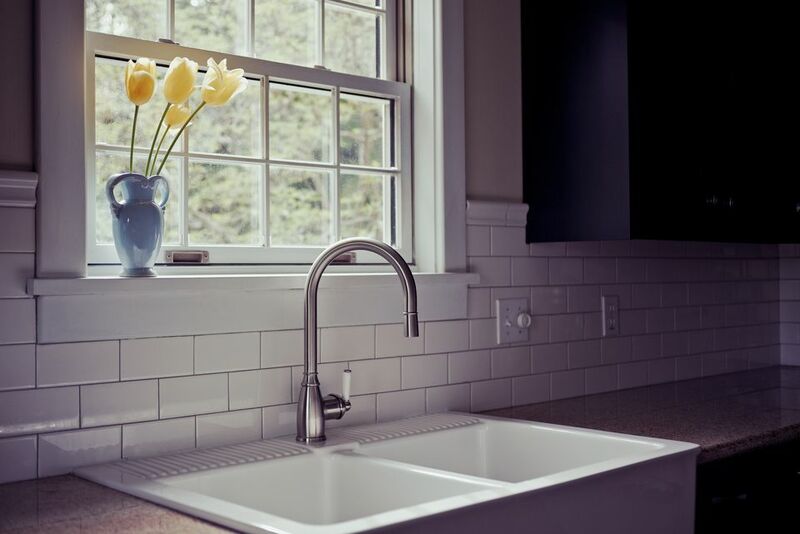 Because of the number of parts which make up this type of faucet, ball faucets tend to leak more than other washerless faucets such as the cartridge faucet or disc faucet. Ceramic disk faucets are the latest development in modern faucet technology. They are identifiable by their single lever over a wide cylindrical body. The disk faucet mixes hot and cold water inside a mixing chamber called a pressure balance cartridge. Two ceramic disks at the bottom of the chamber will raise and lower to control the volume of water flow. Temperature is controlled by a side-to-side rotation of the handle. These faucets are high quality, are very reliable and do not need repair very often. Double handle cartridge faucets look almost indistinguishable from a compression washer faucet. However, you can tell the difference by how the handles feel when used. A compression faucet requires you to tighten down (compress) the washer to close the water flow. With a cartridge faucet, the action is smooth and consistent. With a 1/2 turn, the handle goes from the off to the on position. The faucet turns off without added pressure being required as with a compression faucet. Compression washers have been around since the beginning of on-demand indoor plumbing. They are found in older homes and updated versions are often found used in utility sinks in newer homes to this day. These faucets are typically the least expensive but are most prone to leaks and maintenance. Compression washer faucets are identifiable by their separate hot and cold water handles and their action requiring you to tighten the handles down to close off the water flow. These faucets work by using a compression stem which is a type of glorified screw with a washer at the end of it pressing against a valve seat.